PHILADELPHIA -- Demonstrators took to the streets outside of Philadelphia's Criminal Justice Center Monday evening, rallying for imprisoned rapper Meek Mill, CBS Philadelphia reports. The crowd -- including some celebrities and athletes -- is calling for Judge Genece Brinkley to recuse herself after handing down a two- to four-year prison sentence for the rapper last week. The sentence comes in the wake of alleged probation violations, including an alleged altercation at the St. Louis airport, as well as an alleged reckless driving stop in New York. NBA legend Julius Erving spoke to the gathering crowd Monday night. "I've only met Meek Mill once but he knows my son Julius III and he knows my friend Michael Reuben and they believe in Meek. As we rally today because we all believe in him and that the punishment bestowed upon him is excessive, is cruel and it's motivated by unsavory circumstances," said Erving. "So this practice of jailing people when you feel like it against the recommendation of your own constituents and in this case it was a district attorney and it was his probation officer -- that's got to stop. Recuse the judge and let justice prevail," Erving added. Other notable celebrities attended the rally, including Eagles players Malcolm Jenkins and Vinny Curry and rapper Rick Ross. "In Meek's case it wasn't simply a miscarriage of justice, it was an abortion of justice," said Ross. "I think the Commonwealth of Pennsylvania; they need to take a second look at this bizarre sentencing." "We aren't going to act like Meek Mill is an angel or that he's perfect. He's a man. A man who has made some mistakes and for 10 years has paid for those mistakes," said Philadelphia Eagles safety Malcom Jenkins. Judge Brinkley has overseen the rapper's legal troubles for years following a 2008 drug and weapons case. His probation was previously violated in 2015. At that time Mill was ordered to house arrest. Those rallying say Brinkley showed "extreme bias" during the rapper's case. 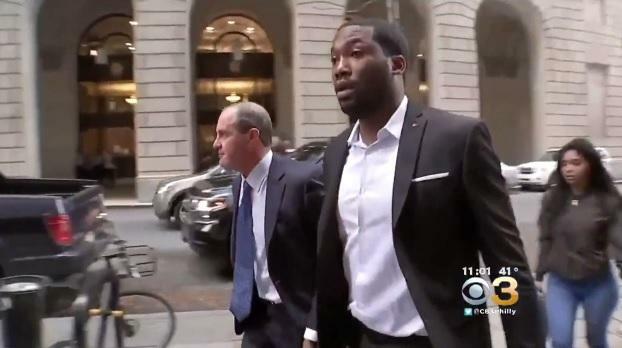 Democratic state Representative Jordan Harris of South Philadelphia says the Meek Mill sentencing is systematic of a larger criminal justice issue. "The difference because the person we're talking about today has multi-platinum albums and has resources the cameras are watching. Had it been somebody else nobody would be paying attention. Mill's attorney, Brian McMonagle, tells CBS Philadelphia he'll file paperwork Tuesday morning claiming Judge Brinkley has shown extra judicial conduct and biased.